If your doors just need to be pushed open, there’s no need for a handle of any kind, but that doesn’t mean you don’t need any door furniture. Having people constantly pushing directly onto the wood of the door will cause a good deal of wear and tear, and there’s always the risk that they could get a splinter from the door. Fortunately, though, we have plenty of push plates for sale. If you’re looking to buy push plates, they come in a variety of sizes and materials, depending on the door and your tastes. The various models available include Polished Stainless Push Plates, Satin Stainless Push Plates and SAA Push Plates, in sizes ranging from 300x75mm to 650x75mm. All these types, whatever size, have deburred and softened edges, and are drilled and countersunk for ease of fitting. You can have them inscribed “Push” or left blank, depending on your preference. There are alternative materials and looks available, though. 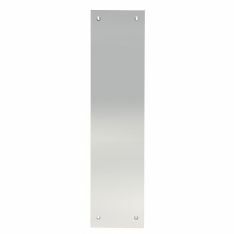 For example, you could have a 457x76mm Polished Brass Large Push Plate or a 382x64mm Polished Chrome Push Plate. These are also available in different sizes, come with a matching backplate, and can also be inscribed or blank. Besides push plates, we have a comprehensive range of pull handles and plates for sale, including pull handles on rose, pull handles on plate, back to back pull handles, bolt through pull handles, face fix and cranked handles, cabinet and kitchen handles, flush pulls and kicking plates.